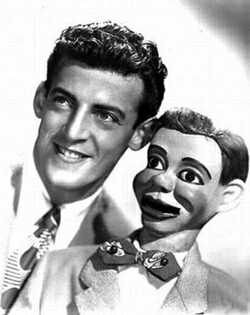 Paul Winchell's ambition was to go into medicine, but the Great Depression eliminated any possibility of Medical School. He was hospitalized at the age of 13 with polio. He passed his time while recovering by studying a ten cent ventriloquism kit he ordered from a magazine. When Paul returned to school he convinced his art teacher to give him credit for building a ventriloquist's dummy. In appreciation the dummy was named Jerry Mahoney after the teacher. Winchell took Jerry Mahoney on the radio over WOR-AM New York, part of the Mutual Network, in 1943. 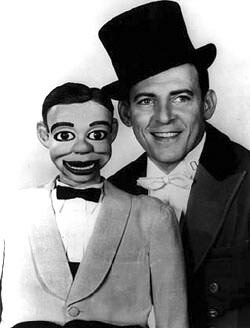 The show missed great success, probably because it was over shadowed by the Edgar Bergen/ Charlie McCarthy show. Winchell and Mahoney acted as summer substitutes for John Gambling's program on WOR in 1948 with a telephone quiz show. If there wasn't room for more than one Dummy on the radio, Winchell and Jerry found success on TV. He hosted and appeared on several shows through the 50s and 60s, and had a very successful Saturday morning kids show, "Winchell/Mahoney Time" (1965-68). Winchell was also successful doing voice work, including many characters for Hanna- Barbera and Disney Cartoons. His best known work was as "Tigger" in Disney's Winnie the Pooh movies. Paul Winchell kept his interest in medicine and became a licensed acupuncturist in 1974. He also patented the first mechanical heart (which has been alleged to have been the foundation of the Jarvik 7 heart pump). He has 30 patents to in his named, including a flameless cigarette lighter and battery heated gloves. Concerned about hunger in Africa, he helped to develop a cultivation method for tilapia fish in sub Saharan Africa. Paul Winchell's Star on the Hollywood Walk of Fame for Television Work at 6333 Hollywood Blvd and for Radio at 6714 Hollywood Blvd. He was great. and he was tigger on Winnie the Pooh if i remember correctly.